Cognitive Dissidence: Ron Johnson To The Rescue! 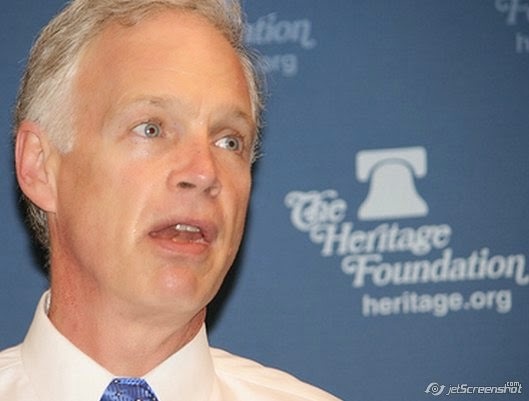 US Senator Ron Johnson somehow connived his way to be the new chairman of the Senate Committee on Homeland Security and Government Affairs. If this filled the gentle reader with a sense of dread and foreboding, good. It should. So far, RoJo's track record with homeland security is to release confidential information for the sole purpose of trying to score political points because Benghaaaaazi! As the new chair, RoJo has laid out a couple of things he wants to focus on. The first-term senator said he and the panel's top Democrat, Tom Carper of Delaware, are taking a trip to the Mexican border where they and others will meet with U.S. Border Patrol agents, local sheriffs, ranchers and individuals with firsthand knowledge of the problems. "Do I know how to secure the border? No. But I know how to develop a process for getting it done," Johnson said. "We are going to take a very analytical approach, starting with the reality of the situation, trying to set achievable goals." The senator said there is a need for double fencing in some sections of the border so that it's not so easy to rip a hole through the barrier from the Mexican side where U.S. law enforcement doesn't have jurisdiction. "The way it is now, someone can cut a hole in the fence and we can't do anything about it," Johnson said. What? Is the fence in Mexico? Or can't law enforcement arrest them when they come through the fence? Or is this just a way to try to sabotage one of the Democrats' talking points? In addition to addressing border security, he wants the committee to hold hearings on matters such as electromagnetic pulse threats to the nation's electrical grid. An electromagnetic pulse (EMP) generated by a high altitude nuclear explosion has the potential to shut down a large portion of the grid instantaneously, so that a single missile with a warhead doesn't have to be very large to inflict great damage. Knowing RoJo, he is probably picturing Kim Jong-Un crossing the Pacific Ocean on a raft armed with toy rockets to destroy us all. But at least he isn't blaming everything on sunspots anymore. Is it any surprise why RoJo is deemed the Senator most likely to lose his seat in 2016? The good news is that it is looking more likely that Russ Feingold will return to claim his old seat back from this impostor. You laugh now. But if you knew how ISIS is massing along the Mexican border to invade the USA, you would take RoJo seriously. The plan is for ISIS to intermingle with Illegal Immigrants acting as drug mules to get free education, welfare money and health care, all to bankrupt the USA. ISIS can do this because Obama is pro-Muslim and wants to bankrupt the USA to destroy the country and declare a one world government. Thank Jesus for RoJo being in a position to save the day. Do you watch anything beyond fox "news"? What happened to Ebola as the RWNJ's threat du jour? Tell that to RoJo. He has no use for your reality-based politics. Wanna know what is extremely disturbing? When Rojo sounds like the adult in the room and everybody believes him. He really thinks that during a terrorist attack, we'd all be much more concerned with Mexican families freely crossing the border???? Like an EMP wouldn't put our concerns a little higher? ?